Unbelievable value. 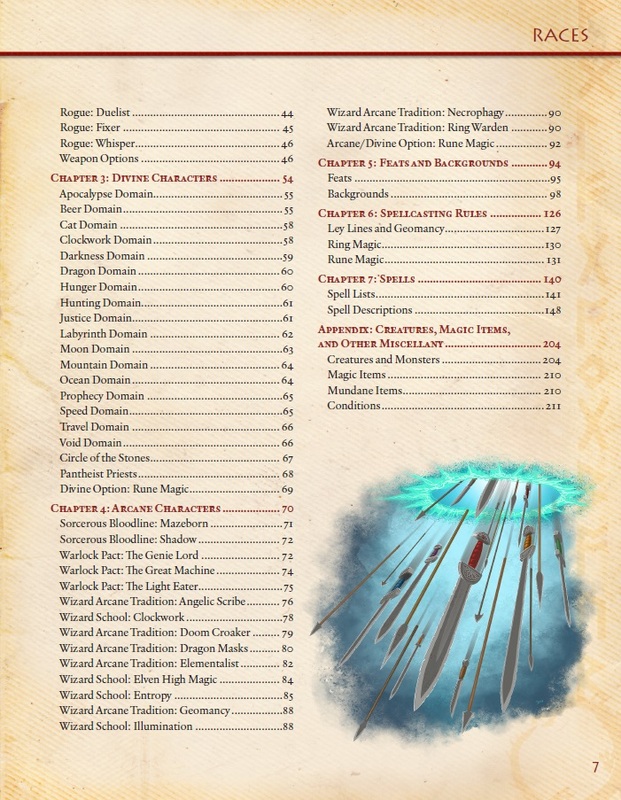 New backgrounds, feats, races, subclasses, weapons and items, about 300 new spells…. 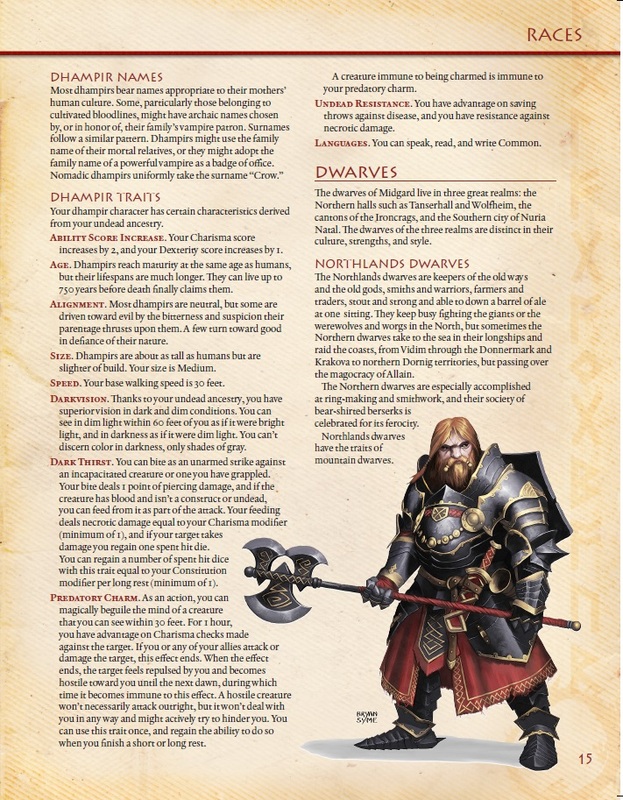 This is by far the best 3rd party player’s handbook available. 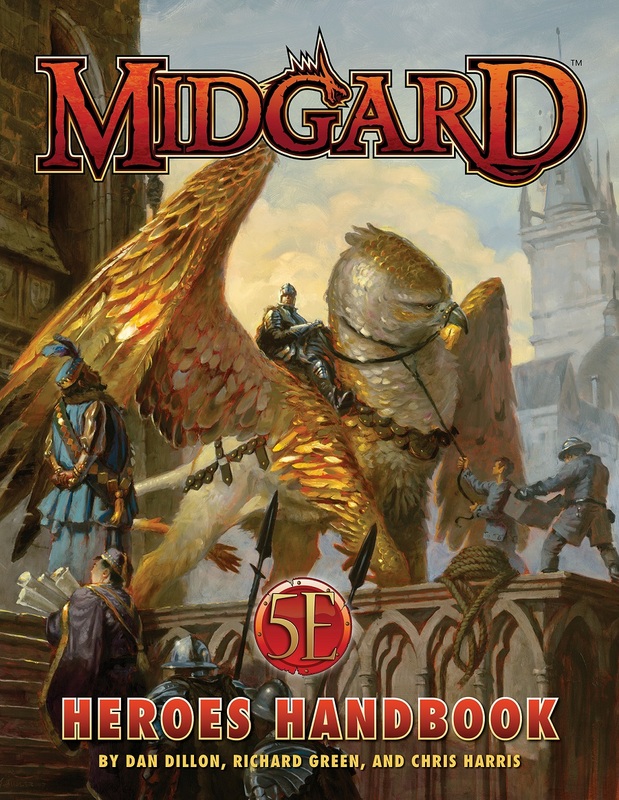 As a fan of Midgard who plays 5th Edition, I’ve been waiting for this book for a long time! I purchased the old Pathfinder Campaign Setting and I was on the fence about getting the 5e Splat books like Midgard Heroes or Deep Magic. When I saw that they were working on a new World Book and accompanying player’s guide I decide to hold off and get this. It has tons of new options. About 50 new sub-classes, wizard schools or divine domains, plus feats, new races and a ton of spells! The artwork is gorgeous although some assets are reused. This is pretty typical of Kobold Press books and not really an issue in my mind. There are a slew of splat books they released prior, Midgard Heroes, Southlands Heroes and Unlikely Heroes, plus the entire Deep Magic series. I think everything from Midgard Heroes is here, plus a few things from Unlikely and Southlands, but not everything made the cut. I’m not sure about Deep Magic, because they’re so many splat books, but I bet not all of it made it in, just the best stuff. If you wanted to be complete, you’d have to look at those too, but they’re are so many options here, I’m not sure you need to. I love the addition of the Shadow Fey, which seem to have replaced the Shadow Elves. They still seem elf-like if you prefer the idea of a dark elf, but I think the Fey are much cooler flavor wise. Windrunner Elves seem to have been removed, which I think is a shame, but the Rothenian Plain was pretty crowded already. I did notice and I’m not sure if this is intentional or a typo but the Different Cleric Domains’ Divine Strike does not deal radiant damage like those in the 5e PHB, but the same type as your weapon. This massive hardcover clocks in at 211 pages, 207 if you don’t count editorial, ToC, etc. – 216 pages minus the usual aforementioned components, if you count by pdf pages and include the covers. This review is based on the hardcover print version of the book, which I received in exchange for a fair and unbiased review. The book was moved up in my reviewing queue at the request of my patreons and due to receiving the print copy of this book. I have also had the chance to take a look at the pdf to ascertain electronic functionality, but have mainly based my review on the print version of this book. Now, first things first – this book is very much the big Midgardian crunch-book, i.e. it focuses on providing new mechanics for your 5e-game. The book does not consist wholly of new material, though: Instead, it also collates and refines material taken from the Deep Magic-series, as well as from e.g. 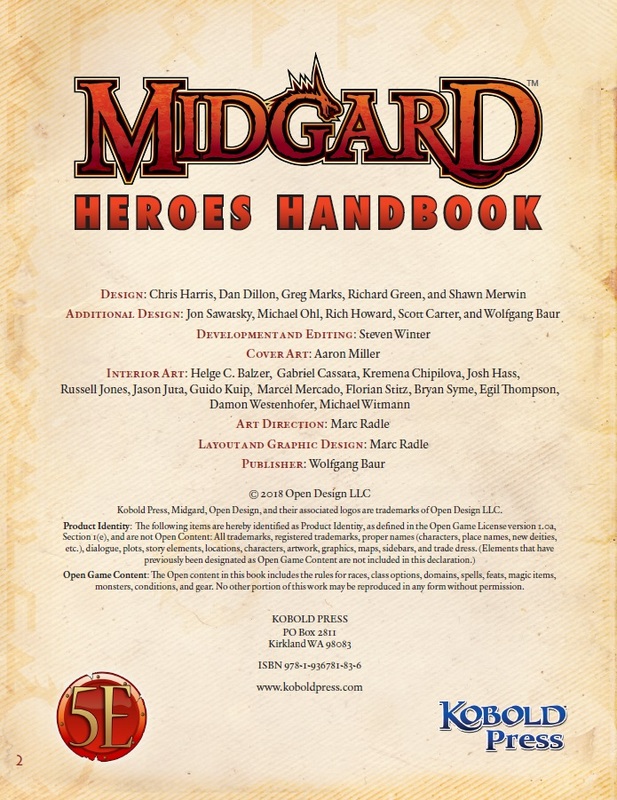 Beyond Damage Dice, and the racial supplements, which were released to much acclaim for 5e, such as Midgard Heroes. That being said, the compilation aspect is very much secondary to the huge amount of new material featured herein. As far as Deep Magic is concerned, the book does only include the player-facing installments of the series, which is, considering the rather problematic Doom & Blood-installment, a boon. At the same time, this means that you won’t find the excellent Void Magic-installment within these pages. Now, this being a book that contains a huge amount of class options, new races, etc., I cannot simply provide you a breakdown of each and every feat, spell, archetype, etc. – if I did go for the level of detail I provided in e.g. my reviews of the Deep Magic-series, the review would be bloated beyond any usefulness and eat more hours of my time than I can devote to a single book. That means that I am going to paint in slightly broader strokes than usual. 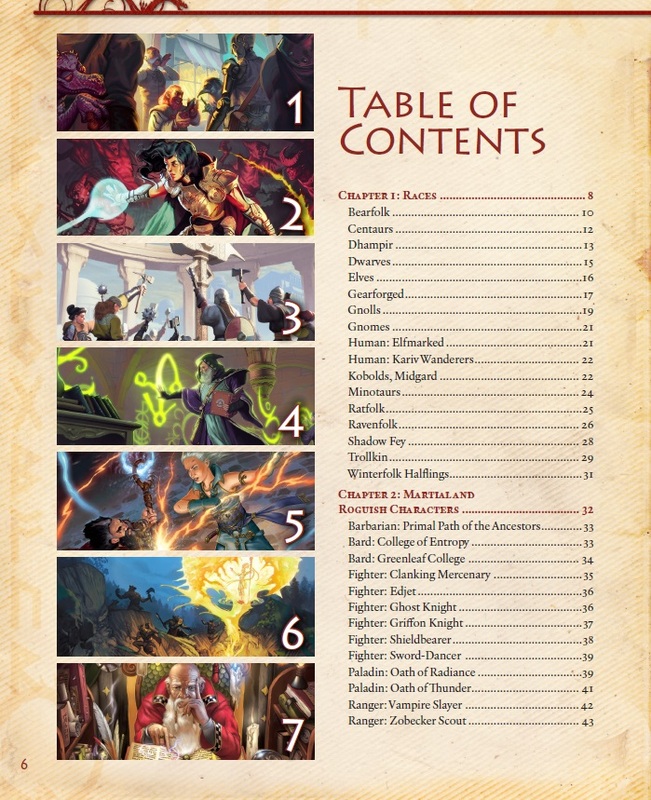 It should also be noted that this is NOT a player’s gazetteer or the like – while the introduction mentions a couple of Migardian regions and themes, the book focuses primarily on rules components and does not offer regional explorations or the like, edited and freed of spoilers for player-use. This is a rules-book, not a setting book – though the setting-specific components do bleed into this book here and there, it is about as setting agnostic as you can be without compromising the flavor. All right, got that? Perfect! So, after the aforementioned quick introduction, we begin this massive tome with the racial chapter. Presentation-wise, this is oriented along the baselines established in 5e’s PHB, i.e. we get notes on nomenclature and the like, advice for the playing the race and the respective mindset, etc. This chapter also contains notes on subraces that correspond to certain ethnicities in the Midgard setting – for example, river elves, canton dwarves, etc. are mentioned. The racial chapter features a couple of favorites introduced before: The centaur, gearforged, dhampir, gnoll, kobold, minotaur, ravenfolk, shadow fey and trollkin make a return here, representing pretty much a best-of of the race-centric 5e-supplements released by Kobold Press so far. 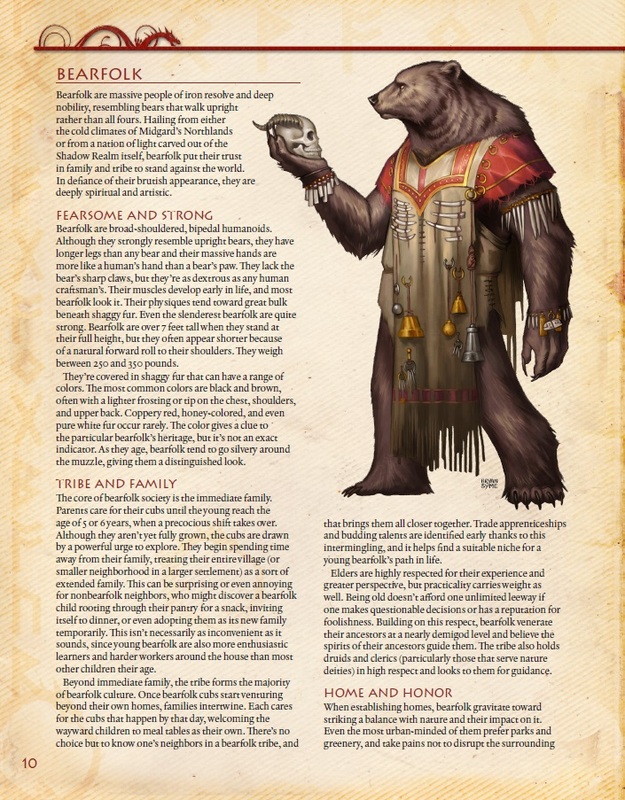 Beyond these, the chapter includes two previously unreleased races, the first of whom would be the bearfolk, who increase Str by 2 and have a 1d6 + Str-mod bite attack that causes piercing damage. They get 13 + Dex-mod natural AC and are treated as +1 size to determine carrying capacity. Bearfolk have proficiency in Athletics and Perception. The grizzlehide subrace gets +1 Constitution and may Constitution modifier times per long rest interval attempt an unarmed strike as a bonus action when making an attack, adding grappling. They are also resistant to cold damage. Purifiers increase Wisdom by 1, get 1 druid cantrip, using Wisdom as spellcasting ability, and once per rest interval, they can roll +1d4 and add it to a save governed by a mental attribute. The second race would be the ratfolk, who increase Dexterity by +2 and Intelligence by 1, but also decrease Strength by 2. They are Small, with a walking speed of 25 ft, and have a swimming speed of 10 ft. Ratfolk get darkvision and may move through a hostile creature’s space as long as it’s Medium or larger. Ratfolk get advantage on attack rolls if an ally is within 5 ft. of the creature and not incapacitated. They get advantage on Handle Animal to influence rodents. All races come with notes on life expectancy, as well as height etc. No complaints regarding the races-chapter – well-presented material here. The second, massive chapter deals with new options for martial and roguish characters, offering options for non-spellcasting classes. Now, even a cursory glance will show you one thing here: The material is not evenly spread, not by a long shot. We get one primal path, two bardic colleges, 6 martial archetypes for the fighter, two paladin oaths, two ranger archetypes and 3 archetypes for the rogue. So yeah, the barbarian gets the short end of the stick here, particularly since the one primal path is neither complex, nor particularly interesting. Advantage on Wisdom saves, once per rest interval calm emotions, a bit psychic bonus damage while raging and freedom of movement while raging will probably not really sell many players. The first bardic college, the college of entropy, has been taken from Deep Magic: Chaos Magic, while the Greenleaf college nets a slightly expanded spell list that nets users of inspiration dice temporary hit points, provides land’s stride and the option to remove diseases and detrimental conditions from a brief list – basically a slightly druid-y bard. Now, as far as fighters are concerned, the clanking mercenary gets the option to temporarily improve armor or weaponry, with higher levels providing construct-themed benefits, like advantage on saves vs. frightened and charmed, reducing exhaustion gained by 1, thankfully usable only once per rest interval and the 18th level option to spend HD as a bonus action to negate some negative conditions. The elite of the Mharoti empire, the edjet, is a specialist of using both shield and versatile weapons, with higher levels providing the option to shoe multiple targets, quicker healing during short rests, once per long rest interval, and at high levels, a cool, defensive trick to help allies and improve your own AC when wielding a shield, all reaction-based. I liked this one, though personally, I would have made the defensive trick available sooner and instead have it scale. Morgau and Doresh’s ghost knights are pretty straightforward, in that they receive a find steed-based creepy horse that upgrades to undead at 7th level. It would have been nice to get stats for the undead steed. Frightening charges, necrotic bonus damage, requiring no more food or drinks and immunity to being frightened are unlocked. The 18th level ability lets you turn insubstantial, which is pretty neat. The second riding-themed option would be Zobeck’s griffon knights, gaining a griffon mount that scales with your level, which is an extremely potent option at low levels, compared to other pets, particularly since 3rd level provides 1/day (weird – why not once per long rest interval?) feather fall, which mitigates the primary danger of falling to your death. 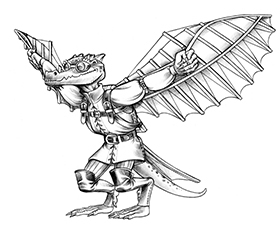 Higher levels yield aerial maneuvers, which increase damage (this scales) and total at 3, +1 gained at 10th level. This one is really strong, and frankly, I’d have preferred more versatility regarding maneuvers. The shieldbearer is a shield specialist, the sword-dancer, surprise, a somewhat dexterous light or no armor specialist. I found both to be pretty enjoyable. The paladin oaths would be the oath of radiance, who has a radiance/light-theme versus undead and creatures from the shadow plane. This is relevant due to for example shadow fey hailing from there. A solid one, though one that made me wish it tied in with the cool angelic seal-engine. The second oath would be the oath of thunder, who focuses on somewhat Thor/Perun-like visuals, with the option to fire lightning bolts via Channel Divinity and a focus on crushing fiends and aberrations. Tenets are provided for both oaths. The vampire slayer ranger does what it says on the tin, providing anti-undead alternatives to those usually gained. Not the biggest fan of such nemesis designs, and 11th level nets +6d6 (RAW untyped) damage when making a melee attack versus a favored enemy. Zobecker scouts are more interesting, gaining the ability to be aware of select items, an expanded spell list and the option to create interesting alchemical devices. I wish we got more selections there, but this one, theme-wise, is one of my favorites in the chapter. The rogue duelist is really interesting; The archetype gets a point-based resource, prowess, which may be used to activate a variety of techniques, which manage to depict an interesting, rather well-balanced array of classic duelist tricks. One of my favorite takes on the concept. The rogue fixer focuses on commerce, securing items, etc. and is probably more suitable for NPCs than for PCs, at least unless you’re running a really gritty campaign. The whisper archetype, reproduced from Deep Magic: Shadow, but alas, sans tweaking the, admittedly minor complaints I had there. Then, we are introduced to weapon options first introduced in Beyond Damage Dice, which I still maintain, are an awesome idea. Special abilities, depending on weapons employed? Heck yes. The base save DC is 8 + proficiency modifier + Strength or Dexterity modifier. Now, I think heavy weapons should be restricted to using Strength, but that is an aesthetic complaint. Now, Beyond Damage Dice, while a good idea, was less impressive, to say the least, in its execution. Needlessly swingy all-or-nothing parries (even though a perfectly serviceable parry-mechanic exists in 5e!) and a general uneven power-curve that makes some weapons better than others did detract from the per se genius idea. Javelins get, for example, an ability that only kicks in at maximum range, making it hyper-circumstantial…and no, it’s not potent. Spears are still non-existent in the engine, focusing only on polearms. This section represents a HUGE missed opportunity to clean up, expand and refine the subsystem. Alas, no such luck. Disappointing. The next chapter deals with divine casters – we get a brief overview of Midgardian deities and a whopping 17 (!!) domains, rules to create a pantheist priest who circles patron deities…and has no drawback for the improved flexibility…and a whopping 1 druid circle. One. This would be the circle of the stones, who receives a spirit guide familiar, bonus spells with a theme of illusion and divination, the option to enhance your spells via a brief bonus action spirit dance, a lifeline of the “prevents death” type, usable once per long-rest interval and at 14th level, a potent spirit form. I like this one. But seriously. One paltry circle versus a metric ton of domains? Why? Anyways, the domains provided would be Apocalypse, Beer (Heck yeah, spirituality I can get behind! ), Cat, Clockwork, Darkness, Dragon, Hunger, Hunting, Justice, Labyrinth, Moon, Mountain, Ocean, Prophecy, Speed, Travel and Void. The latter would probably have made for a cool tie-in with the void magic engine that is absent from the book, but that as a purely aesthetic observation. The domains are pretty straight-forward in their benefits. I am not the biggest fan of +10 to a Dexterity ability or skill check via the Cat domain’s channel divinity, and I’m concerned about the Travel domain’s easy, channel divinity-powered exhaustion level remover at 2nd level. The next chapter deals with new options for arcane casters, encompassing two sorcerous origins (here called “sorcerous bloodline”), 3 warlock pacts, and 11 wizard schools. The Shadow bloodline is reprinted from Deep Magic: Shadow Magic. The other origin would be the mazeborn, which represents minotaur blood and thus doubles proficiency bonus to Charisma checks with them, if it does apply to the check. The base ability nets you the ability to bonus action cast a spell that requires a melee attack in conjunction with Dash – sans limits. 6th levels nets horns and the option to cast enlarge via 1 sorcery point. 14th adds + Cha-mod damage to spells that cause psychic damage, and one creature damaged by such a spell may also be affected by confusion for 2 sorcery points. The 18th level ability allows you to spend 3 sorcery points to create phantasmal labyrinth distortions, which can prevent reactions, imposes disadvantage on attacks against you, and requires concentration to maintain as a balancing factor. The warlock pacts include the genie lord from Deep Magic: Elemental Magic, the Great Machine from Deep Magic: Clockwork Magic and the Light Eater from Deep Magic: Shadow Magic. While these pacts are per se tightly presented, the few minor rough patches have not been addressed…and if you’re a fan of the Deep Magic-series, you get exactly 0 new content here. Now, fans of the wizard will smirk at that, but we meet several old acquaintances here as well: The Angelic Scribe, the Clockwork, Dragon Masks, Elementalism, Elven High Magic, Entropy (chaos magic), Illumination and Ring Warden would be previously released options. Here, we have something I enjoyed seeing – the chaos magic, for example, has been streamlined and made a tad bit more precise, making it now one of the most compelling aspects of the book, at least as far as I’m concerned. Elven High Magic could still be slightly more precise in its details, but remains a favorite of mine as a person. Dragon masks, angelic glyphs, etc. are still frickin’ amazing. Now, what about the new stuff? Well, for one, we have the doom croaker, obviously a ravenfolk-inspired one, which halves time and gold for adding divination spells to the spellbook at 2nd level. The tradition is basically a slightly Norse-flavored divination specialist, flavor-wise aligned with the ravenfolk. In case you were wondering: No, strangely, it does not interact with the rune magic system. Speaking of which: Yes, it makes a return. No, Raido STILL has no rune mastery power. Urgh. On the plus-side, the appendix once more contains the stats for the Vaettir and tupilak golems, elk horn rod and nothing pole and the golem now gets proper flavor-text and formatting. The neat hypothermia and snow blindness rules from that installment can similarly be found in the appendix at the end of the book, but I’m getting ahead of myself. The phenomenal ley line engine for 5e is similarly included here and represented by the geomancer and in the general spellcasting section. This leaves us with the rather brief necrophagy tradition, which is obviously cannibal/dead-eating themed and as such aligned with the darakhul. This one is a necromancy specialist who gets an undead familiar (tweaks noted) and who can eat the dead to fortify himself. Kudos for the ability being kitten-test-proof, i.e. you can’t cheese it by eating a bag of kittens. Per se solid. The feat chapter focuses on the supplemental feats for the respective arcane traditions. Now, the next section is one of my favorites in the whole book: We get 20 fully realized backgrounds, with two variants added on top. The backgrounds come with all rules-relevant material, as well as the personality traits, ideals, flaws, and bond-tables we expect, and they are actually INTERESTING. The titles say it all: Amazons of Perunalia, Arbonesse Exiles, Benmean Scholars, Blood Sisters (you know you want to play an evil nun! ), Dancing Bear Guides, Dhampirs of Morgau, Exiles of the Black City, Ghost knights, Gnoll Caravan Raiders, Haunted Villagers, Krakovan Rebels, Mharoti Emmisaries, Miners, Mountain’s Witnesses, Mystics of Baba Yaga, Neimhein Gnomes, Northlands Reavers, Nurian Theurges, Seers and Prophets – the backgrounds provide some seriously awesome flavor, ooze the great Midgardian lore in many cases…and still offer some options that are applicable sans any reskinning. With the exception of Seer, Prophet and the 2 variant backgrounds (previously released in Unlikely Heroes), all of these, at least to my knowledge, are new – and they’re not reskins either: The gnoll caravan raider, for example, is different from the generic raider background previously introduced. A ton of flavorful, fun new material in this chapter. Huge kudos! Now, obviously, with such a focus on magic, the final “big” chapter (I already touched upon the appendix) contains a ton of spells. The chapter begins with a spell list by character class, with the spells organized within by spell level. Huge plus here: The respective spell-lists, and the individual spells in the alphabetical presentation that follows the lists, sport tags that denote the magical tradition to which they belong. This is CRUCIAL in navigating this book, at least in my opinion. You see, it allows the GM to allow, for example, character x access to clockwork magic, while his buddy gets ring labyrinth magic. This is very, very important. However, at the same time, the organization of this chapter makes it ultimately slightly less comfortable to use than it probably should be – you see, this adheres to 5e’s, pardon my French, idiotic idea that it’d be smart to no longer note in a spell’s block what kind of classes can cast it. It’s one of the most inconvenient formatting decisions of 5e and one I intensely dislike – I also find it odd, since some Deep Magic-installments did note the classes for each spell in an improvement regarding that component. Oh well. That being said, since the book does adhere to the formatting convention established by the PHB, I will not penalize it for this decision. At the same time, the lack of an index does constitute a comfort detriment of sorts as far as I’m concerned. Anyways, let us take a look at the spells shall we? The chapter encompasses, sans the aforementioned spell lists, a total of 55 pages of spells. Here, I can complement the Kobold crew: Previously not codified reactions now specify their precise conditions; verbiage that erroneously refer to “charm and fear effects” and the like was cleaned up, so the rules are definitely more precise than in their debut. There are still nitpicks to be found here and there, though – while in the context of walking wall, it’s evident that we’re talking about melee attacks, the text per se does not say so. Chaotic vitality refers to caster level, a concept that does not exist in 5e – on the plus-side, though, it now has its potential haste effect properly codified. To me, that is more important, since the CL-snafu, frankly, can be handled by a half-way competent GM…and it’s the only instance of this reference in the whole book. Much to my pleasant surprise, some of the spells that previously were too potent have been adjusted to present more sensible effects. Shadow trove, for example, can no longer be used to get rid of artifacts, spilling its contents on the floor instead of vanishing them. Slither, the second level spell that turns you into a shadow not still nets you a potent defense and RP-options, but does so without being broken. Starfall has similarly been balanced in a better way to account for its increased flexibility when compared to other spells. Now, the book contains, spell-wise, three Deep Magic-traditions previously not codified as such: Labyrinth, Rothenian and hieroglyphs. The latter sports, for example, a potent 8th-level combined true seeing and detect magic that automatically identifies each spell witnessed, as well as the much-beloved beguiling gift, translated to 5e to the rejoicing of tricksters everywhere. Bless the dead prevents rising from death as an undead – and must be cast when touching the corpse. Boreas’ breath freezes water. Broken charge lets labyrinth specialists divert the path of an incoming adversary and inflicts minor psychic damage. Its low range and reaction (properly codified) casting time keep it in check. Confused senses, revelations via moonlight, calling forth scarab swarms, cursing targets to not be sated by food… there are some nice ones here. On a purely formal observation, desiccating breath’s average damage value is not required for spells. 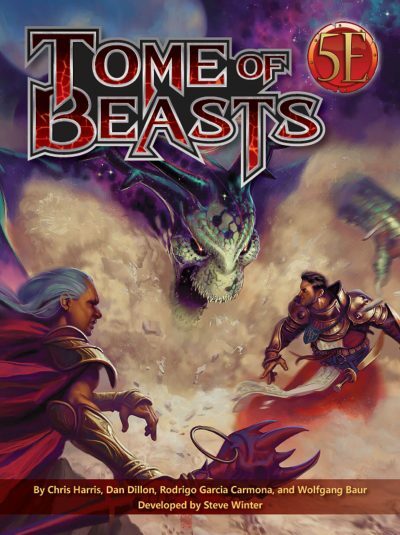 This spell also refers to animals, which is not correct terminology in 5e – the creature type is “beast”. I am also not the biggest fan of e.g. eidetic memory, which, instead of giving you something unique to derive from its benefits, translates to a somewhat lame and slightly Pathfinder-y +10 to Intelligence checks. On the plus-side, an encrypt/decrypt cantrip makes sense, though more potent versions would be the first that I’d research… Exsanguinate’s damage at 5th level may be somewhat pitiful, but it reduces maximum hit points until a long rest has been completed and may incapacitate targets, which is rather potent. On another note, RAW, it causes bludgeoning damage, which is a slightly odd choice, considering that the blood drain of vampires, for example, is based on necrotic damage. It also can, RAW, affect creatures sans blood, which is even odder to me. Anyways, that is a more or less aesthetic complaint. Assuming a potent form of the gods (avatar stats included) is a neat idea. On the plus-side, having a target dragged away, potentially to death, by spectral ponies? Heck yeah! All in all, this chapter represents a pleasant surprise. The book has refined and steamlined a lot here, and the fact that it has retained the structure of the spell traditions means that A GM can pretty easily allow players access to the material that’s considered to be appropriate for the character. The appendix, beyond the material already mentioned, includes notes of clockwork scarabs, special features for various breeds of Midgardian horses, notes on kobold mounts, and the ring servant also makes a return here. We also get snow cat stats and rules for alchemist’s smoke and clockwork caltrops. Editing and formatting are, as a whole, very good. It is evident that care has gone into dealing with quite a few hiccups in previous iterations of material compiled within, both formally and rules-language wise. Layout, as always with kobold Press’ books, is gorgeous and adheres to a two-column full-color standard. The book contains a lot of gorgeous artwork, though fans of Kobold Press will be familiar with quite a few of the pieces. The pdf version comes fully bookmarked for your convenience. The hardcover is a beautiful book with thick, matte pages and glossy front and back cover. Its binding is solid as well – so the recommended version of this book, without a doubt, would be print. 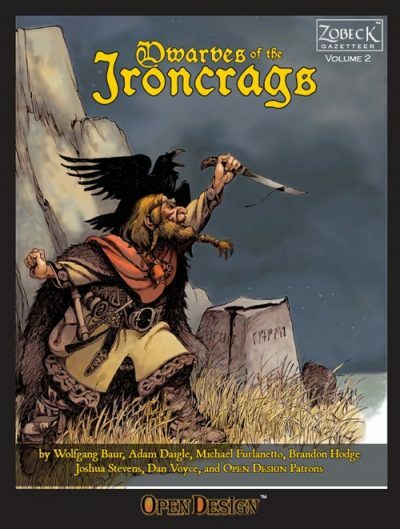 Designers Dan Dillon, Greg Marks, Chris Harris, Richard Green and Shawn Merwin, with additional design by Jon Sawatsky, Michael Ohl, Rich Howard, Scott Carter and Wolfgang Baur, have created the best crunch book Kobold Press has released so far. Kobold Press’ strength traditionally did lie more in the phenomenal lore woven, in the adventures and the popular Midgard setting’s amazing flavor. While this book retains some Midgard flavor, it also represents a strong focus on the mechanical aspects of the game, creating basically a second Player’s Handbook in scope and ambition. This book is a tough nut to rate, for it is at once a compilation, yet still offers a lot of new material. This material, while not always as refined or as mechanically interesting (you won’t see much that can hold a candle to dragon magic, for example), contains some true gems that I thoroughly enjoyed. 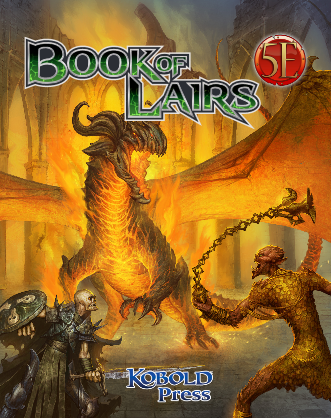 If you haven’t yet checked out Kobold Press’ 5e-offerings, then this is an absolute no-brainer: There are phenomenal pdfs compiled herein, and quite a few of the options have been improved, redesigned and streamlined. This is definitely better than the constituent pdfs. At the same time, I confess to having expected slightly more. The fact that e.g. Beyond Damage Dice’s brilliant ideas haven’t been expanded and balanced struck me as odd. Another weakness of the book pertains the distribution of class options. If you’re a barbarian player or have a druid, you’ll be rather underwhelmed, while your cleric and wizard buddies drown in new options. I don’t expect books to offer something for every class, mind you, but the distribution of material herein is uneven to the point where it is somewhat jarring. My final gripe here is with the lack of an index. That being said, all of these gripes, when looked at in the context of the whole book, with its inspiring backgrounds and flavorful ideas, do pale to an extent. The question remains, whether to get this or not. The response is somewhat tricky. Fans of Kobold Press who already own the constituent pdfs may well consider the added refinement this offers worth it, may adore having the material collected and in a handy print tome. On the other hand, if you’re such a fan and expected more rules-components that reach the level of brilliance of some of the more complex and mechanically innovative Deep Magic installments, then you may be disappointed at a high level by the majority of new content being solid, but also pretty conservative in its design-aesthetics. 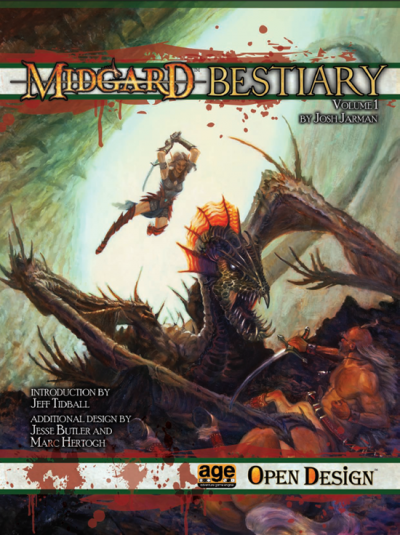 If you’re new to Midgard and Kobold Press’ 5e-offerings in general, then get this – chances are that you’ll love it! Similarly, if you’re like me and vastly prefer proper print, then this is a no-brainer. This book, let me make that ABUNDANTLY clear, is a very good, fun and densely packed book of cool stuff. At the same time, it also, at least to a degree, could have been a tome for the ages. While some of the new martial options are amazing, while the improvements are significant, the book could have been a defining milestone. With evenly distributed material and more stuff for the poor barbarians, sorcerers, warlocks and druids. With a streamlining and expansion of, for example, the weapon options from beyond damage dice….you get the idea. This could have been THE defining crunch-handbook, an unofficial PHB 2…and it still can be seen as such. However, it also represents a book that, while compelling, interesting and well-wrought, feels like it doesn’t 100% reach the heights that it could have. Ultimately, I have to take all those perspectives into account, and thus, I arrive at a final verdict of 4.5 stars. Whether you round up or down, ultimately depends on what you’re looking for in this book. Personally, I consider this to be closer to 5 stars, and as such, this is what my official verdict will be. If you’re looking for some seriously huge tome of crunch for your 5e-game, then look no further than this.